June 21, 2013 – The 24 Hours of Le Mans kicks off Saturday, but Scotland’s Ecurie Ecosse racing team is already making plans for the 2014 race. The legendary sports car team has completed a major sponsorship agreement with Duncan Taylor’s Black Bull blended Scotch whisky brand for this year’s British GT and European Le Mans Series races and next year’s Le Mans bid. Ecurie Ecosse won the overall championship at Le Mans in 1956 and 1957, and has had three F1 World Champions and two Indianapolis 500 winners (Jim Clark and Dario Franchitti) as drivers during its history. 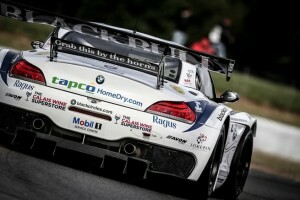 The partnership kicked off with last weekend’s British GP races at Snetterton, in which the Ecurie Ecosse/Barwell Motorsports BMW Z4 GT3 retired with a brake problem in the first race, but scored a 7th place finish in the points during the second race. The team’s next outing will be in European Le Mans Series competition at Austria’s Österreich on July 19 and 20.